Connor McDavid is likely going to win the Art Ross trophy this season as the NHL's leading scorer. As of this morning, McDavid sits seven points ahead of Chicago's Patrick Kane and nine points ahead of Boston's Brad Marchant with 94 points (29 goals, 65 assists). Barring any major changes (the Oilers have 4 games left to play, the Blackhawks and Bruins only have three) McDavid will finish the season with more points than any other player in the NHL. But he's also tantalizingly close to (in his second year, in the "Dead Puck" era) 100 points. This would make him the first Oilers player to reach that magic mark since Doug Weight did it in 1995-1996 (104 points). With 4 games to go and 6 points to make up, McDavid would have to score at a 1.5 point-per-game pace to achieve the mark. But that's not an entirely impossible task...for one, as they pointed out during the Saturday night game versus Anaheim, McDavid has been scoring at 1.4 pts/gm since February 24th. While the Oilers next two games are against two stingy teams (LA Kings are 3rd in the NHL with only 2.4 GAA, and the struggling San Jose Sharks are 6th with 2.46 GAA), our final two games are against the lowly Vancouver Canucks and their 2.90 GAA (though, of worrisome note, the Oilers have never gotten 3 or more goals against Hongcouver yet this season). Still, McDavid's race for 100 points isn't out of reach. But wait [Doug Wait? heh heh heh... -ed], there's more. McDavid currently has the team lead with 29 goals (Draisaitl has 28, and Maroon has 27). One more McDavid goal will put him in the 30 goal club. That will be the first time an Oilers player has reached the mark since Jordan Eberle's 34 goals in 2011-2012†. If two of these three players tops 30 goals this season, the Oilers will have two 30+ goal scorers since the 1996-1997 campaign when Ryan Smyth had 39 goals and Andrei Kovalenko had 32. Vincent Damphousse had 38 and Joe Murphy had 35 in the 1991-1992 season as well. What about all three? 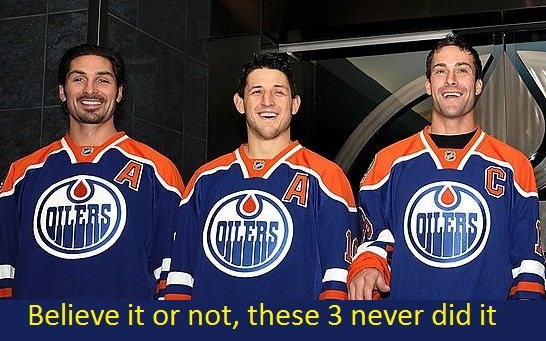 Would you believe there has never been an NHL season where three Oilers players had 30+ goal seasons? No, seriously. In 1989-1990 there were four Oilers with 30+ goals (Messier-45, Anderson-34, Kurri-33, and Tikkanen-30), and as you might suspect during the high-flying-80s‡ the Oilers had five players with 30+ goals for a six-season stretch (1983-1989)§. This could be a chance for the Oilers to make history...and oddly enough, probably even more likely than McDavid's 100. † Try not to think about that year so much, when Eberle was a phenom in his sophmore season (he had 18 goals the year before) and looked to be the next huge Oilers goal scorer. He had 16 goals the next season (he has 16 goals now) and only twice since has broken the 25 goal mark. ‡ Much like how you can't refer to the 2012-2013 season without calling it a "lockout-shortened season" (it's a law in Canada), you also can't refer to the NHL in 1980s without calling them "high-flying". The 1970s were high-flying too, actually, but between the Montreal dynasty and the rise of the Broad Street bullies, it's not especially known for its scoring. So with four games left in the season, there's a lot of magic still left in the Oilers run. Stay tuned.